A plan for war against Iran? CNN has a story titled What war with Iran would look like. Here's an excerpt. A deployment of minesweepers to the east coast of Iran would seem to suggest that a much discussed, but until now largely theoretical, prospect has become real: that the U.S. may be preparing for war with Iran. It looks like the plan is to use mostly air power. No one is talking about a ground invasion of Iran. Too many U.S. troops are tied down elsewhere to make it possible, and besides, it isn't necessary. If the U.S. goal is simply to stunt Iran's nuclear program, it can be done better and more safely by air. Personally, I think attacking Iran is long overdue. We simply can't afford to have "the world's central banker of terrorism" (Condi Rice's words) to have nuclear weapons. They don't call the place Londonistan for nothing. I have to think that Pope Benedict shouldn't have quoted that sentence about "things only evil and inhuman, such as his(Mohammed's) command to spread by the sword the faith he preached." He could have made his point more delicately. Now that I think about it more, I realize that while there are definately times when one has to be diplomatic, we simply can't live our lives in constant fear that we might upset "the Muslims" and cause them to riot. Look, if people want to get upset and write letters to the editor, fine. If they want to write denunciations on blogs fine, as long as they do not encourage, incite, or condone violence. If they want to start a boycott, fine. Those are all good democratic traditions. But Muslims are simply going to have to understand that rioting, violence and threats of violence are simply unacceptable. As such, we should stand with anyone who is under attack. We stood by the Danish when they were under assault, and now we should stand with the Pope. Whether you are Roman Catholic or not is irrelevant. Mario Mauro, vice-president of the European Parliament, said in a statement today, "Let us defend the Pope without ifs or buts, let us defend reason," in answer to the reactions from the Muslim world to Pope Benedict XVI's lecture at the University of Regensburg on Tuesday. "The monstruous attempt on the part of many Islamic leaders, even the so-called moderates, to distort the Pope's reaching out to all religions (through the lecture),in order to hit out at Christians and the West shows us the gravity of the danger we are facing," Mauro continues. He underscores how "the islamo-nazi ideology that permeates the thought of fundamentalists represents the most dramatic distortion of the use of reason." "They use God as a pretext to pursue a plan for power, and this is what the Pope has denounced, thereby defending freedom for all, especially for those Muslims who look to religion as an experience of the sense of life, and not as a shortcut to political power. "It is remarkable that so many names, too many, among those with political responsibility (in the Western world) are not coming to the defense of the words said by the Vicar of Christ! It is almost as if they are ashamed or are too cowardly to speak up in defense of reason and freedom." Far from defending him, Muslim leaders across the world are demanding apologies, and various Muslim groups are threatening his very life. When has anyone from the Muslim world every apologized to the West for anything? When has a Muslim leader every apologized to the West for the (tens of?) thousands of terrorist acts carried out in the name of Islam? When has a Muslim leader every apologized to the West for the vile anti-Semitic and anti-Christian propaganda that is a staple of the Muslim world? A 70-year old Italian nun is killed in Somalia as "revenge"
Egypt's Muslim Brotherhood has retracted their acceptance of the Pope's apology and is now demanding a"detailed apology which will put a definitive end to the confusion"
"Two West Bank churches were set afire early Sunday as a wave of Muslim anger over comments by Pope Benedict XVI construed as anti-Islam grew throughout the Palestinian areas"
This is insane. These radicals see apologies as weakness, and issuing one only encourages more Muslim violence. They want abject apologies over every little real or imagined offence, and we must not get into the habit of issuing them. Did we learn nothing from the "cartoon jihad" of earlier this year. Evidently some people did not. 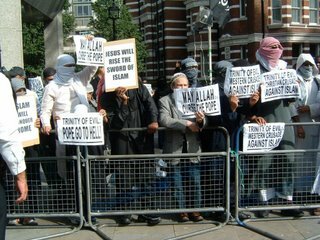 It is laughable to witness the angry, violent demonstrations denouncing any suggestion that Islam is an angry, violent religion. 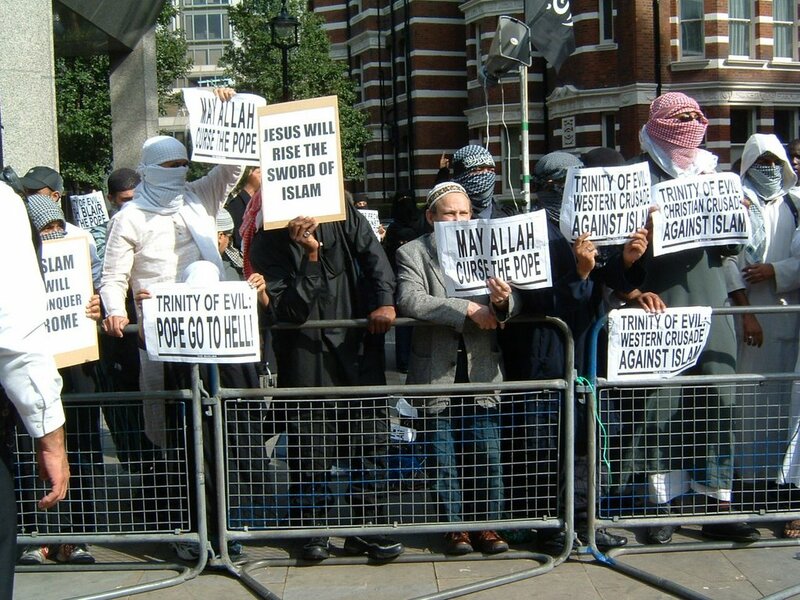 It is hilarious to observe the wails of victimhood and oppression as Islam's religious leaders call for killing Jews and Christians; beheading those who insult Islam, even as their own rhetoric isn't so much insulting as it is directly threatening the rest of the world.